I have a tall order for a Monday morning: we’re being very honest with ourselves today! If you’re a more experienced teacher, you might realize upon self-reflection that it’s very tempting to fall into a rut. Because, let’s face it, teaching is exhausting. Tailoring instruction to your specific students, allowing for exceptionalities of all types, being creative, giving constructive feedback, entering grades, calling parents… I’ll just stop the list right there. However, it does us good as educators to be reminded that our attitudes, tone, and demeanor dictate the paths of learning in our classrooms. I think it’s fair to say that in an average American public school, there are a lot of demands being made on teachers which can obscure our vision. How can we break through that fog to rediscover the joy and fun of educating others? Let Guided Inquiry Design lead the way! 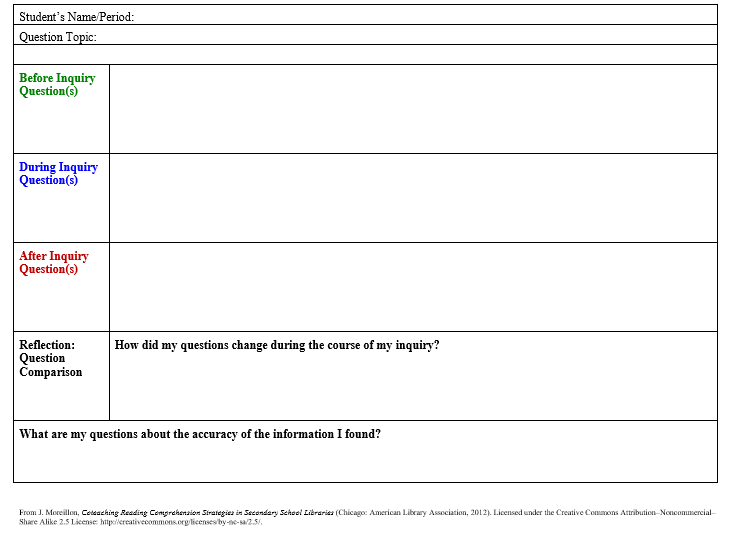 This inquiry model isn’t effective solely for the students, but also for the educators. When was the last time you put yourself in your learners’ shoes? Done something you’d never tried before? Read something about which you knew absolutely nothing? Read something that you knew would be very difficult? Put yourself outside of your comfort zone? Engaging in these things makes us feel like learners and discoverers again, which means remembering what it’s like to feel uncomfortable and anxious and overwhelmed. 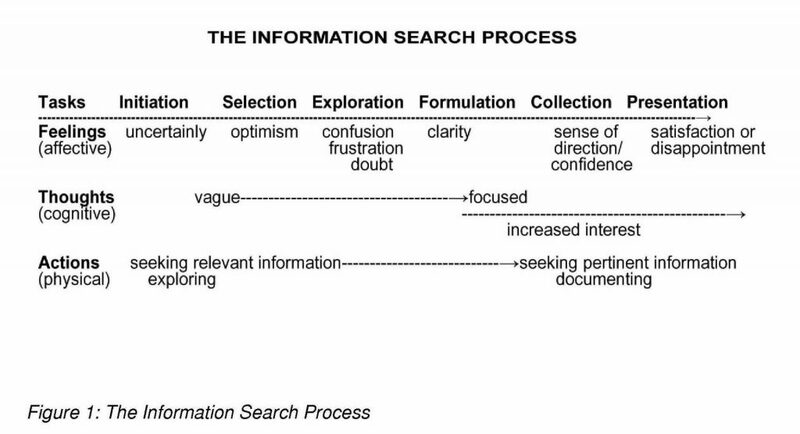 We know this is exactly what happens to learners thanks to the Information Search Process research conducted by Kuhlthau and reaffirmed over the past 2 decades! This week, I’m going to share some ideas that I plan to present next week at the South Carolina Association of School Librarian (SCASL) conference in Greenville, SC. I will be encouraging fellow librarians to take steps to foster an inquiry mindset with their students based on the GID model, sharing some successes and struggles I have had. In this blog post today, I’m going to focus on two issues which I personally believe greatly influence our level of success: time and patience. How many times today have you already said, “I don’t have time for that!”? Keep track and analyze your results. Time hasn’t changed; we still have 24 hours each day! Librarians hear that response a lot when we suggest alternatives to students taking notes from PowerPoint presentations or reading from a textbook. Although we do live in the age of standardized testing, there are still a lot of courses at the high school level which are not tested. Be honest with yourself about how you spend your time with your students. You don’t need to worry about drill-and-kill with content area knowledge if students are encountering your content in authentic texts and authentic learning activities (like visiting a museum, listening to a guest speaker, interviewing their local government representative). Remember yourself as a student. If you didn’t like to read your textbook when you were a student, then there is no chance your own students do. Have you ever passed out a research assignment to students as the beginning of a unit? Do you only allow students a day or two to find information? Librarians know from experience that research is often presented in this way. If you find yourself dreading a research assignment as much as your students, then you know it’s time for a change. Students who feel pressured to complete work quickly will not turn in quality work, nor will they probably care because an intent to learn has not been established. Yes, exploration and discovery take time. But what a useful way to use the time we have! Partner with fellow teachers and librarians in your building to help brainstorm and share resources. There is never a reason to go it alone. Be willing to honestly examine your own attitude toward time. You teach your students about what is important through your words, actions, body language, and tone. Make exploration and discovery something you can’t wait to do either, and be the learning role model for your students. As Kuhlthau (2015) states in Guided Inquiry: Learning in the 21st Century, “Guided Inquiry has the power to excite students about using resources for learning” (114). Furthermore, “Sources from the community enliven the inquiry process” (115). Use your time to find resources beyond your textbook or PowerPoint presentation: the school library, fiction, objects, museums, experts, parents, public library, business professionals, community officials. Guided Inquiry Design states that during inquiry, the learning team “uses modeling, listening, and encouraging” to engage and guide students. Prioritize time in your classroom and library to model curiosity, listen to students throughout their process of discovering information, and encourage questioning. These ideas naturally lead into the second issue I believe is greatly important: patience. I am the first to admit that I struggle with this one! Patience and time are directly linked. If students are going to build their own knowledge through an inquiry stance and develop information literacy skills, then they have to be the ones doing the learning. We don’t need more research and books to prove that to be true again and again. How many times did it take you to truly learn something well enough that you could teach it to someone else? Probably more than once! Allowing students to make mistakes, maybe even on purpose, so they can learn from them is critical. Avoid telling students answers. Use questioning to guide their thinking. Moreover, being patient with someone shows that you care. Being patient shows that you are willing to give your time to someone else. When students trust their educators, a safe learning environment is established and they are willing to take more risks which can lead to more discoveries. Be patient with learners as they reflect on their abilities in order to make goals, then give them the time to reach those goals. 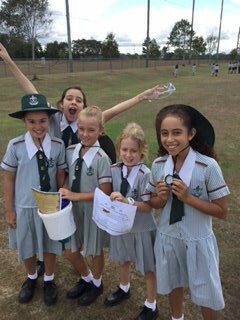 Dedicating time and patience to the inquiry process has many rewards! Return to the question which begins this post. Do you even want to return to your classroom? Being excited and curious, having patience, and using authentic sources of information will influence how students answer. 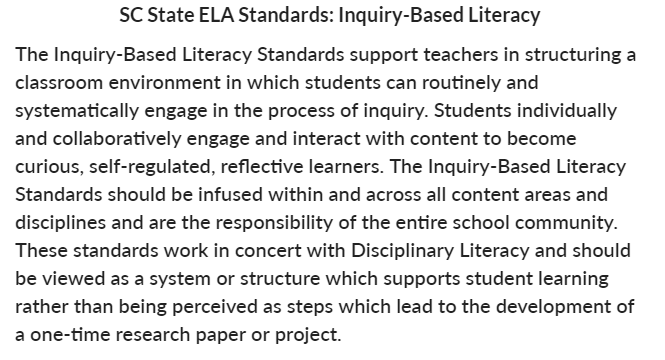 In my next post, I will share some ideas for the Open, Immerse, and Explore phases of GID and why they are so important to the inquiry mindset. “You will need a good dose of irrational perseverance to stick to GI” and implement it in your curriculum,” say the authors of Guided Inquiry: Learning in the 21 Century. After seven years of trying, I must say it is perfectly true. You need perseverance to learn all the time, perseverance to endure futile tries to convince your colleagues to collaborate with you, but most of all you need perseverance to monitor you students and make changes in your practice when you see that what you are doing is not helping them learn. But perseverance I have, because I believe Guided Inquiry is the best model of learning we, school librarians, can use to help students grow. Guided Inquiry is in accordance with my personal mission to do everything I can to sustain children’s natural enthusiasm for learning. Have you ever seen a small child who is not eager to learn? It breaks my heart when I see how this eagerness withers as children grow older, and by the middle school they end up hating school because it is boring. The answer is, I believe, in constructivist approach to learning. Guided Inquiry is the answer. D. H. Wells once said that civilization is a race between education and catastrophe. Guided Inquiry is such a powerful tailwind for education. It makes learning meaningful for students, gives them skills to use for further learning, it helps them to gain deeper understanding of the curriculum. 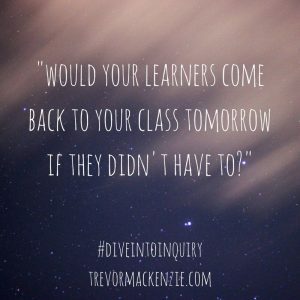 After carefully reading and rereading and studying the books (one mentioned before, Guided Inquiry Design: A Framework for Inquiry in Your School and Guided Inquiry Design in Action: Middle School) attending free webinars held by Leslie at EdWeb, I gradually started applying GI in my teaching. First, I applied some of the tools in our ongoing school projects. I talked about GI at our school staff meeting. There was a language teacher who proposed that we give it a try together. We asked history teacher to join in for our first GI unit. My colleagues did not read about Guided Inquiry, so it was my responsibility to explain the concept to them. They were familiar with KWL framework and project based learning which made me easier to explain GID. However, it took a lot of patience and persistence from all of us. I was grateful to them they were willing to try something new and I took care not to make them feel uncomfortable in the process. Our first GID unit was not perfect, but I think we did excellent job. We connected literature (Bruckner: Sadako wants to live – this is obligatory book for 8th graders which most of them never really read), history curriculum – WWII, and civic education (Human Rights). Photo -3rd grade students preparing for sharing what they learned about healthy food and habits. The Open session was rich. It took place in the library. We managed to acquire beautiful posters and brochures about contemporary Japan from the Japanese Embassy. After discussing that we watched two minutes video from Hiroshima Memorial Museum and an excerpt from a documentary about atomic bomb survivors. Our discussion helped students to better understand the book, which was the task for Immerse. In Explore sessions they had a lot of material, both print and digital to go through. After that they had to pick a role to prepare for, because the create and share phase were preparation and staging of a mock trial in which all the children had to play a role of a character in a book or a role of a court official (judges, attorneys etc.). Students were engaged and motivated during the process. There was so much to talk about. They studied the period described in the book to the detail, but they also draw connections with current affairs. Unfortunately, the topic of war is familiar to them. Although they are the generation born after recent wars in our part of the world, they hear it discussed in their homes, in school and in the media. 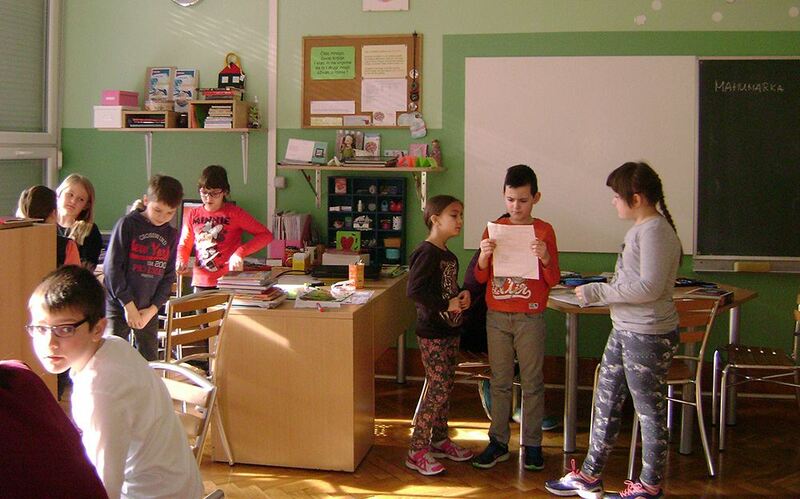 Next school year, I made another presentation about GID for my colleagues in school, presented the concept again, together with our last year’s experience. I asked for volunteers again. There were more teachers who were interested this time. Next year, a few more. My goal is to enable every student in school to experience Guided Inquiry. So, there is still a lot of work to be done. In the meantime, I had several opportunities to share the experience in GID with my follow librarians at the district, but also at the national level. The last one was a workshop at our Spring School in Trogir in April 2017 which was very well received. Yesterday, I explained how I spent last semester introducing the Guided Inquiry Design model to a cohort of teachers at my high school. Today is all about showing student work related the Open, Immerse, Explore, and Identify phases of GID inquiry-based learning. I’m going to extend my discussion about using questioning as part of implementing GID by showcasing a unit my library service learners completed. I’m also going to show how one English teacher in particular worked to implement concept-based research assignments as well as questioning into her curriculum. I am fortunate that my school offers media center service learning as an elective unit of credit. Students fill out an application and we take teacher recommendations. The students who participate learn about running a library, fielding reference questions, researching the future of libraries, you name it! 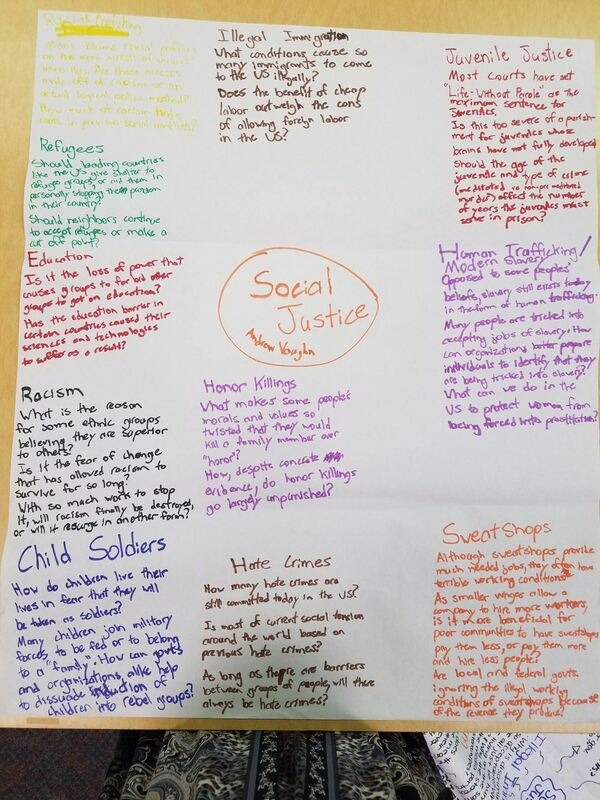 My fellow librarian Karen Hill and I have developed a unit focused on learning about social injustice. For the Open phase in this unit, our students watched 2 shorter documentaries posted on the New York Times website (Check out the website, you’ll get lost in the possibilities!). We kept a shared Google Doc of questions in order to provide scaffolding at the beginning of the unit. For the Immerse phase, we created a gallery walk with 13 stations featuring various examples of social injustice in the world today. 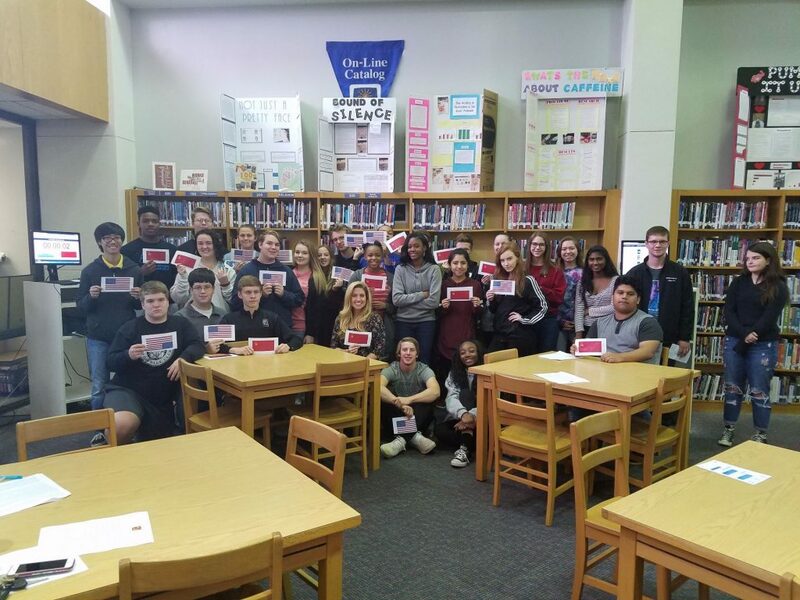 Students read from print books, articles, infographics, watched clips from documentaries, political cartoons, statistics, all sorts of fun stuff! They had to create their own lists of questions about each topic as they rotated through each station. And there are so many opportunities here for embedding information literacy skills. Have students practice citing sources as they create questions, and have them question the sources themselves. Introduce them to authoritative resources they won’t know about, such as the ProQuest Statistical Abstract of the United States! 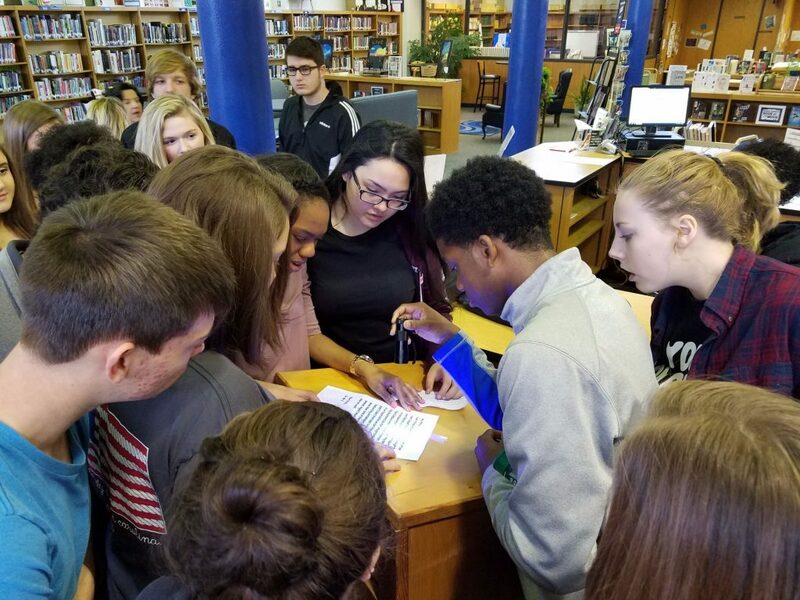 Once students have experience with the gallery walk approach, start having them select the sources instead of the media specialist! I cannot emphasize enough how effective we have found the stations activity to be in my experience with implementing GID. Students can move through the stations at their own paces, ideally, or you can use a timer if more structure is needed. Students respond honestly and find topics they are genuinely interested in. The great part about this particular group was that once we entered the Identify phase, only 2 students out of 10 chose a topic that was included in the 13 stations! They branched out and found other topics, which was inspiring to watch. We had one particularly great success story this past year with a reluctant learner. She didn’t like to read at all, and it was hard each day to keep her from texting the entire class period. She truly blossomed during this project. She chose to research teen suicide because, as she told us, she didn’t know anything about it. She was engaged in her research and in her proposal wrote that maybe our high school should establish a help hotline. Remember that in GID you do not begin a unit with an assignment; you begin a unit with an open invitation to learn! We didn’t introduce the assignment until the Identify phase. Don’t let students get stuck on the mechanics of the assignment; you’d rather their energy be spent on the content! Now, back to the awesome English teachers I work with! 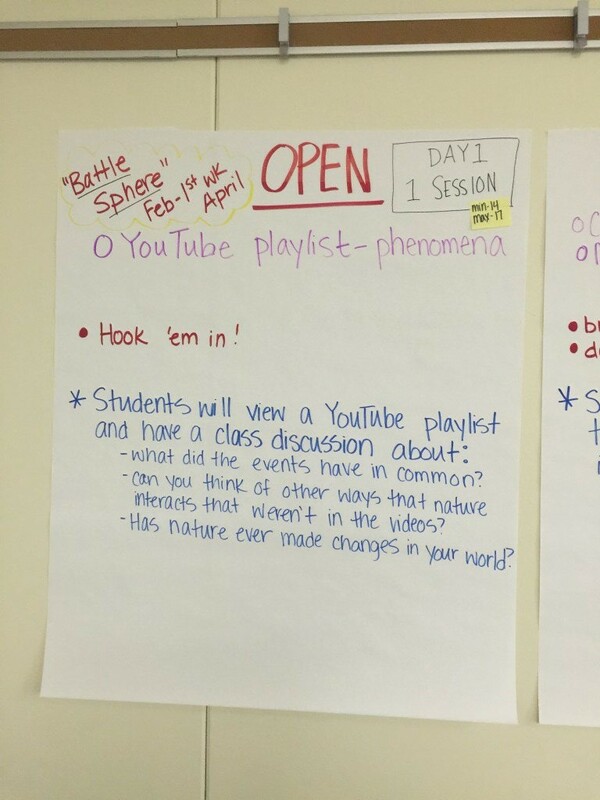 In our cohort, we focused on designing concept-based research opportunities driven by student-led questioning beginning with the Open, Immerse, and Explore phases. One classroom English teacher, Sarah Plant, re-envisioned her traditional Great Gatsby research paper (by the way, Sarah recently had to move away. We’ll be sad about that for a long time). 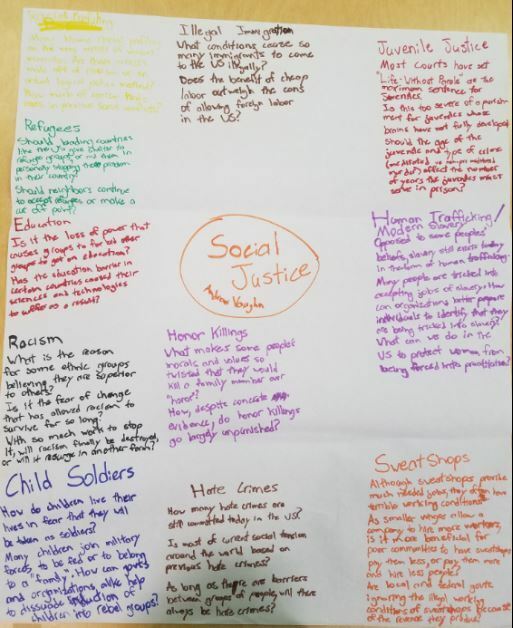 While students might traditionally research aspects of the 1920s, she realized that assignment might fall under the “bird unit” categorization. 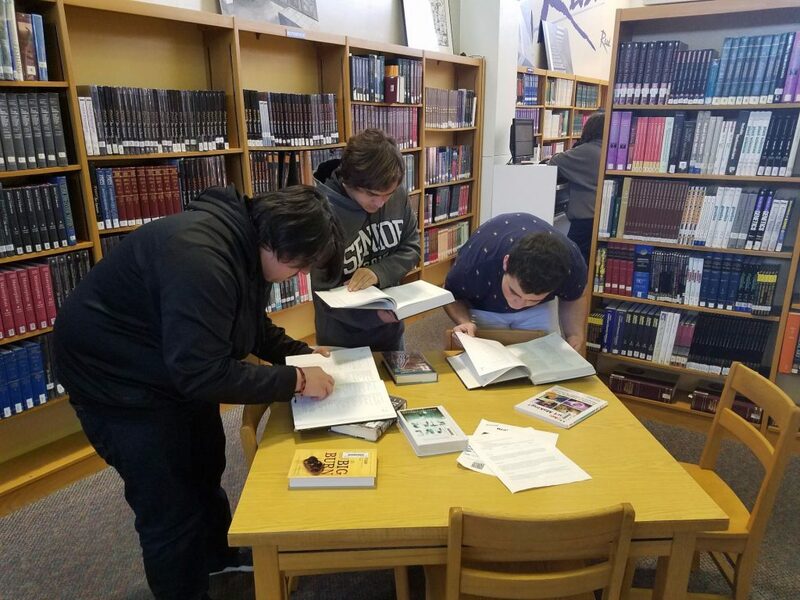 While it is, of course, still necessary and worthwhile to know and to understand 1920s culture for successful reading of that novel, we realized that there might be more effective opportunities for authentic learning and research by moving to a more concept-based assignment. Plus, students are too tempted to simply copy and paste information with “bird unit” assignments! 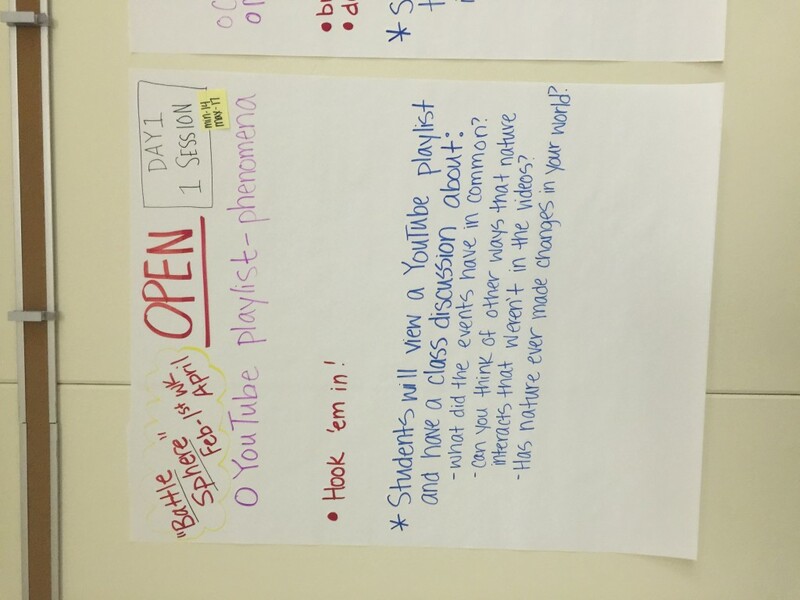 For the Open phase, Sarah had the students watch some short videos and they wrote down questions while watching, then sharing as a class. 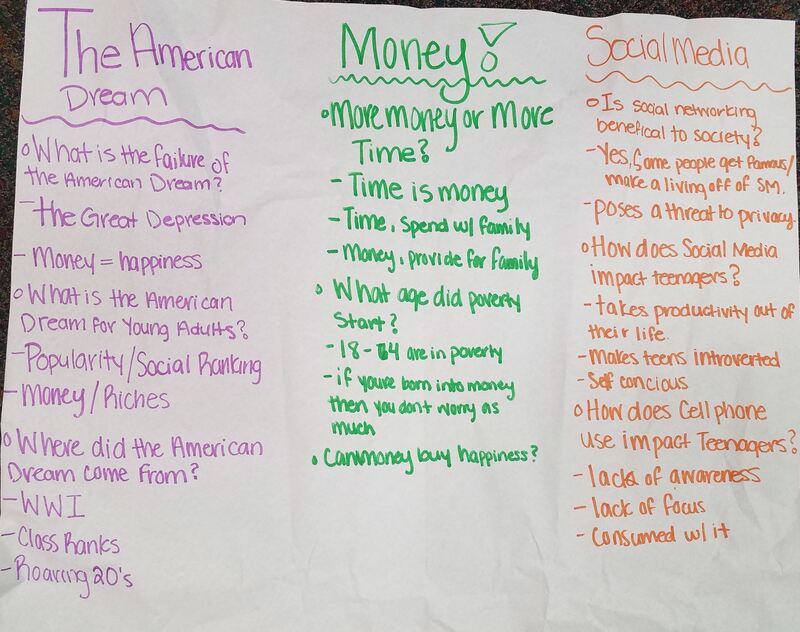 Sarah next came up with 3 concepts related to The Great Gatsby: effects of social media, effects of poverty (and the American Dream), and effects of money on happiness. (While choosing the concepts ahead of time provided scaffolding, students were allowed to research their own concepts discovered throughout this process.) Karen and I then searched through our databases for information related to the concepts. We printed relevant articles, infographics, found print books, encyclopedias, etc. (For example, try “How to Buy Happiness” from the Atlantic, April 2017). 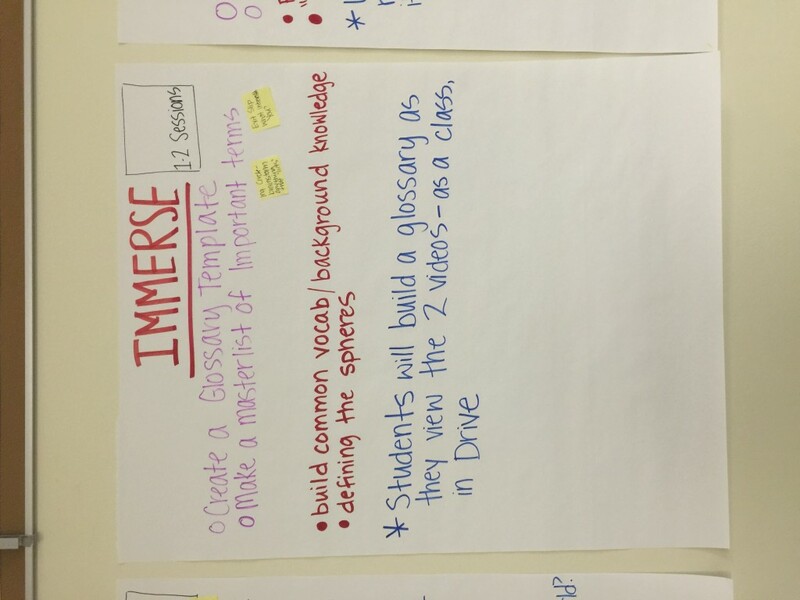 We then designed a gallery walk activity for the Immerse phase. Students were given time to visit each station as a group. The groups designed questions based on each station’s focus. Most of the groups wrote down superficial questions, which gave us an opportunity to model asking effective questions. 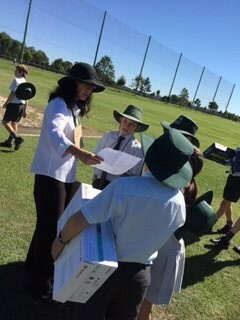 We also monitored the students while they worked in groups, giving guidance and suggestions as needed. Sarah shared that moving toward researching concepts required more advanced researching from the students. This move required more synthesis skills from the students, and they genuinely learned something because they chose their topics. 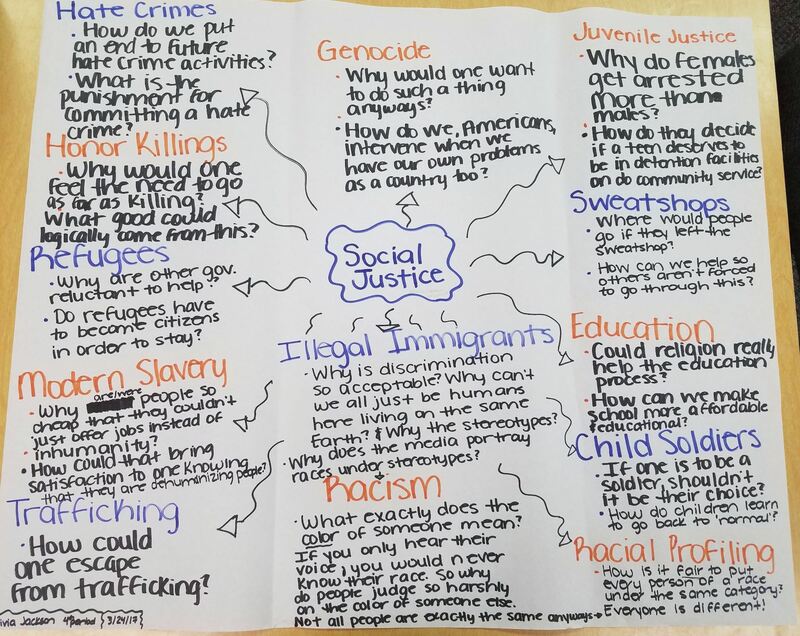 She saw improved essay structures and stronger thesis statements because they weren’t just trying to summarize historical information about the 1920s. This part of her project touches on the last stage of GID, Evaluate. 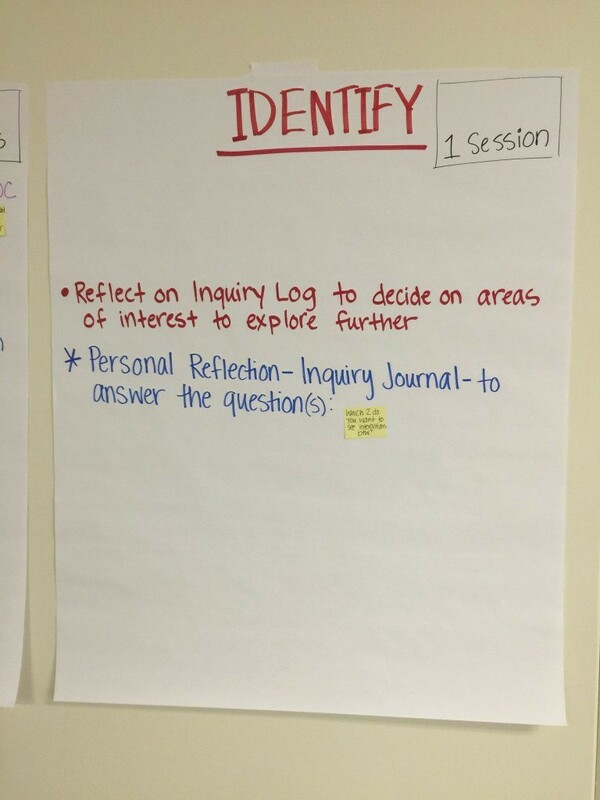 I spent a good deal of time in our cohort meetings emphasizing the importance of self-reflection throughout the entire inquiry process. I shared some strategies I used in my own classroom to help students evaluate not only their skills but also their behaviors. Creating specific goals for each assignment keeps students from feeling overwhelmed, particularly the reluctant learners. Last post, I talked briefly about the relationship between Design Thinking and GID. Today, I’d like to dig a little deeper into that relationship and look at how these two models can complement each other. As we will see, each model has its strengths that can support the other assuming that the context is right. One thing to keep in mind through this discussion is that the origins of each model are significantly different and so the emphasis is different in each. Guided Inquiry came out of the recognition that student research projects were ineffective and often caused students a range of unintended emotions. Carol Kuhlthau’s research looked at identifying how (or if) students were engaged at various points of the research process and looked at ways of increasing that engagement. Almost exclusively, the typical medium for demonstrating one’s knowledge was the research essay. The Design Thinking model came from an attempt to understand how folks who make new things work. This looked at trying to codify the often messy process that someone building anything from a car engine, to a lemon juicer, to a prosthetic might use. While these are very different processes – and one might argue that the way one person operates within a research or design process might be very different from another carrying out the same task – there are enough parallels to make the discussion fruitful. Let’s start at the very beginning. After all, it is a very good place to start! Both Design Thinking and Guided Inquiry begin with open collection of information. This begins with a broad spark from some experience that kicks the process into gear (Open in Guided Inquiry, the design brief in Design Thinking). 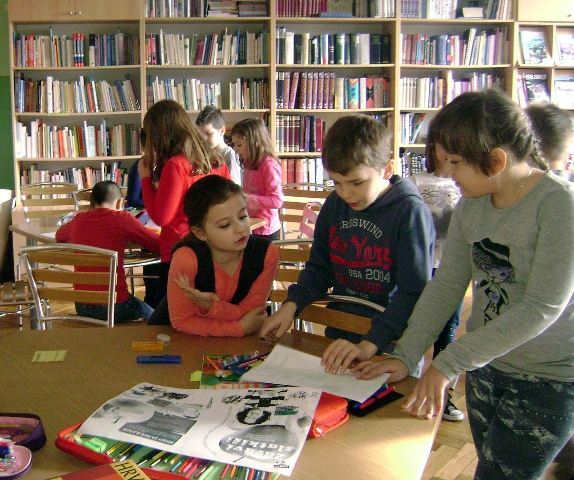 Guided Inquiry breaks this process into three phases – Open, Immerse, Explore – and allows students a period of loosely guided wallowing in the topic in order to build genuine connections and interest. We recognize that the topic is likely brought down from on high by the teacher, but every attempt is made to ensure that the student sees a real connection with their own life. Likewise, Design Thinking uses an Empathy phase. This is a very human-centred process that builds understanding of the needs of the users of whatever is being designed. This will include interviews and other forms of research that simply build an understanding of the problem. While this phase is typically human-centred, I find that there is also an element of research here as well. To understand other’s needs and to truly understand the problem, there is likely some straight-up book or web research that digs into the concepts behind the issues. For example, if one is building a prosthetic hand for someone else, one needs to understand how the hand is going to be used (an office worker might have different needs than a rock climber), how materials affect the way the hand can be used, and perhaps what other designs may have been used in the past to address similar issues. Of course, an understanding of the bone and muscle structure of a normally functioning hand would be immensely useful! Next, comes the definition of the problem. In GID, this comes in the phrasing of the ultimate question being addressed and may look like a driving question, a research question, a thesis statement or any number of carefully wordsmithed structures. In Design Thinking, this is the definition statement and can come in the form of a question that starts with, “How might we…” or it can look more like a statement that reads “User X needs Y because of Z.” In both models, we spend time building broader understanding in order to come to a point where defining the problem is effective. There are plenty of stories of designers who, after an effective empathy phase, define the problem in a way that the end user had never thought of, but on reflection, addresses the true nature of the problem better than the use ever could have. The solution is something far different than was originally expected. Likewise, a teacher might have an idea of what directions a student might take a GID unit, but until the personal connections with the topic are made, the ultimate direction of the projects can be surprisingly different! Once we have our definition, the paths of the two models diverge a little. In Guided Inquiry, this is where we get down to the work of gathering and digesting information for our research. In Design Thinking, we can think of the Ideation phase as a process of gathering as many possible solutions to the defined problem as possible. In GID, the ideas come from others; in Design Thinking, the ideas come from ourselves. You might think of Gathering as focusing your thinking while Ideation as a process of widening your thinking, although that would only be partly true. The purpose of Ideation is to consider all possible solutions and then pick the “best” one for the next phase. While the process is somewhat different, it points in the same direction. The fun begins in the Create/Prototype phase. Both of these are where the learning manifests itself into some creation, whether that be a written paper or physical product. Both involve the playing with ideas that are a result of the previous phases and articulating thinking in a way that will ultimately be shared with others. It should be pointed out that in both models, the apparent linear sequence is somewhat of a fallacy and I would say, no more a fallacy than between the gathering of ideas and the articulation of them. An essay writer will find that there are remaining questions that need to be answered and will go back and gather more information as much as an engineer might get to a certain point with a prototype and realizes that the idea simply won’t work and needs to go back to the ideation phase. Finally, the work needs to be shared and reflected on. In GID these are the Share and Evaluate phases. In Design Thinking, we test the prototype and that process, in all likelihood, involves testing against the users’ needs and sharing it with those users. GID promotes the idea that this sharing should not be the private handing in of an essay to the teacher but sharing learning back to the community of learners in order to extend and deepen everyone’s learning. In Design Thinking, that sharing is more dependent on the situation. If the design problem has been presented by a single person, then maybe the sharing is back to that individual. Usually, there is a larger user group that the prototype is tested with. The essential point in this is that the purpose of sharing is different. GID shares to deepen community understanding while Design Thinking shares in order to evaluate the effectiveness of the solution. It strikes me, as I write this, that GID is might be typically good for thinking about concepts while Design Thinking might be good for thinking about things. I’m sure that this is a drastic over-simplification, but there is some truth in it. GID can be used to solve problems by building something, but the nature of the research is primarily conceptual. You might be trying to understand people’s perspectives or the reasons behind something. The results of that conceptual research might be manifest in writing, physical objects or virtual simulations, but the concepts are at the focus. In Design Thinking, the thinking is more about how we make something to solve a problem. It can be a subtle distinction, but the emphasis is important. The kinds of things one thinks about when building a solution to a problem might be what materials are best to use, how we connect those materials, what function our object needs to perform and how the design serves the function. Clearly, there are concepts underlying all of this, but the concepts serve the process where in GID the concepts are the process. Again, this is likely a drastic generalization and many examples can likely be brought forward that show the weakness of this argument, but I think that there is some use in at least exploring this comparison. Once we understand the strengths of each model and how they relate, we can use that knowledge to build even more powerful units in particular areas. Of course, there will be situations where one model stands on its own brilliantly and would likely be made weaker by forcing ideas of the other into it. But there are situations where the combination is even more powerful. The research ideas behind Open, Immerse, Explore and even Gather can underpin the Empathize piece for those Design Thinking processes that require more academic underpinnings. Likewise, the ideas behind Empathize can support more socially based GID units. Of course, given that Design Thinking is often about building a solution to a problem, some of the prototyping ideas can help similar Create phases of GID. Next post, I’ll look at some questions and issues that I’m having with both models. It seems that the more that I explore, the more questions I have! Stories are the fabric of our lives. Stories are the fabric of our lives, whether we are reading a story, watching a story, dancing a story, painting a story…stories weave our lives together in ways that bring meaning and connection to our lives. Stories show us how much we share common experiences even with backgrounds that come from very diverse cultures. There is something magical about stories that connect us to one another. In the English Language Learning (ELL) classroom students come together from diverse backgrounds and cultures, each with unique stories and unique languages. As beginning or emerging speakers ELL students have little or no understanding of English, never mind having an understanding of the language of the peers in their classroom. An ELL classroom can easily consist of ten different languages. What do they have in common? Story! As teacher, librarian and storyteller, we wondered how we might use that common factor of story to build speaking, listening, writing and information literacy skills. Our journey begins with a story…. I reach my hand into a bag, in the bag I find a smooth rock and my story begins…. It was a cold dark night. The air was heavy, fog rolled in off the mountains into our small fruit farming and coal mining valley. Rooftops were swallowed and the lights seeping through windows made the houses look like giant jack-o-lanterns dancing in the swamps of a misty bog. In my house we were headed to bed. My brother went to his bedroom and snuggled in under his heavy quilt. My mom shooed my sisters and me to bed. Our bedrooms were in the basement. Dad wouldn’t be home for another 8 hours. He was doing the graveyard shift at the coalmine where he worked to supplement his struggling fruit farm. I could say the night wasn’t all that different than any other school night, early to bed, early to rise, except it wasn’t. In the wee hours of the morning a scream pierced through the darkness that shrouded the house. I woke and struggled to figure out where I was. The house was full of smoke. The scream was pulling me up the stairs. Stumbling through the darkness, tears streaming down my face from the sting of the smoke, I saw my mother dragging my brother out into the hallway. His eyes were glazed over, he was not breathing. My mother’s scream changed to commands, “open the doors, the window” My sisters and I sprang into action. “Pray” my mother said. We did that too. I grabbed a blanket, the frigid January frost swept quickly into the house through the open doorway and windows. I was shaking. Not sure if it was from the cold or from the fright of all that was happening. I began to give my brother mouth-to-mouth resuscitation. Mom was on the phone, calling the ambulance, calling grandma, calling our pastor. Somehow she needed to get word to my dad who was down in the pitch-black belly of the coalmine. The rest is kind of a blur, lights flashing, being spirited away, with grandma? Honestly it was hard to put it all together and make sense of everything that was happening. Would my brother be ok? Would he live? Would he be the same if he did come back? I couldn’t sleep. I wondered. I prayed. I think I even cried. All that fear, all that uncertainty lifted when Wayne walked into grandma’s house the next day. 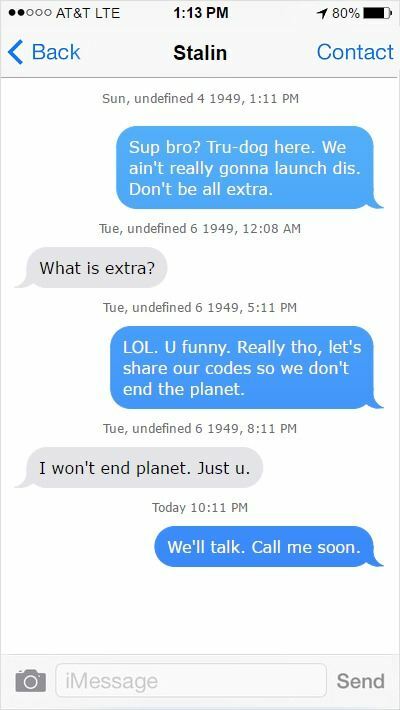 The first words he said to me? “Boy, I knew you were full of a lot of hot air!” We laughed, we hugged, we cried. But this time I was crying because he was the same old joking, funny guy that had gone out into the night under flashing lights just hours before. “So, I bet you are wondering what this rock (I hold up the rock that I pulled out from the bag that started the whole story), has to do with the story I just told you”. Well my brother is all grown up now and he likes to collect rocks. He finds beautiful rocks and he takes them home and he polishes them up. He finds rocks that don’t seem like anything at all until he takes them home and finds their hidden beauty. And then? He gives those rocks away. He carries a pocket full of them wherever he goes, and if you happen to be in a restaurant where he is, you might see him walk over to a table that has a young family and he asks the mom and dad, “Can I give your child this rock?” Children love his gifts and parents walk away feeling special. I hope someday you are in a place where the rockman is and he sees you and gives you a rock as beautiful as the one I pulled out of the bag. And if you do get that chance, you will know the story of the rockman! 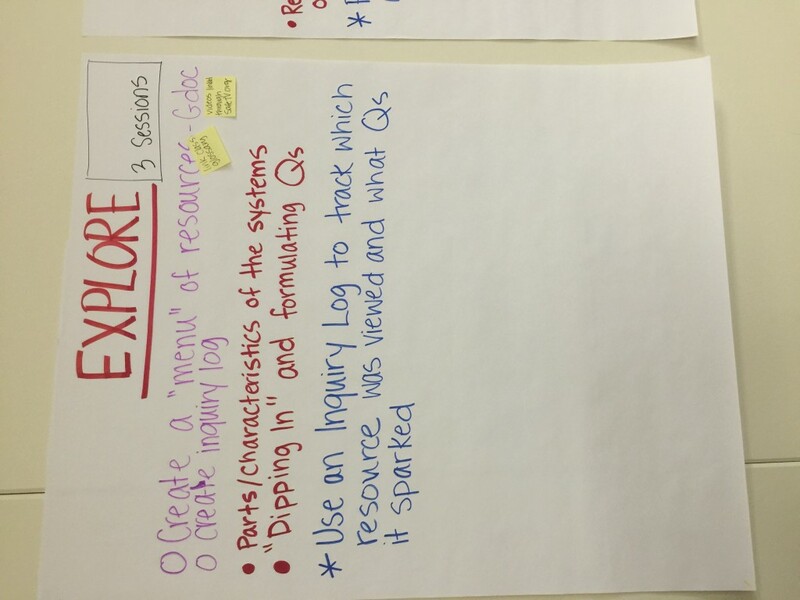 This is an example of the OPEN phase of our Guided Inquiry Design Unit. Storytelling becomes the loom in which we will weave together our entire unit. There is a high level of student interest. Students share their own narrative stories following this model lesson. Each student is asked to bring 3 personal items in a bag we give them, from which they will drawn and tell their own personal story. We spend a great deal of time in the OPEN phase as we want students to have ample time to understand the meaning story has in each of their individual lives, the lives of their families, and the culture from which they come, as well as the eventual person they will be partnered with. We also need to build trust for these new language learners. We need to build trust for us (the teaching team) and in each other. These are students who are working hard to acquire a new language and they need the confidence that they are in a trusting environment. Through the focus on story we are able to bring understanding that stories show us how we are alike and how each of our stories enrich the lives of others. This understanding is the opening for learning about other cultures and countries. Over the course of our unit our students will thread this understanding of story into the research they will do about the country and culture of the partner they are teamed with. Look at your given photo, and then briefly (1-2 words) answer these questions off the top of your head. Use your answers to help you connect the photo to a personal event in your life. Who or what is in the picture? What are their relationships to each other? What activity(ies) are happening in the picture? Is someone going to or from a location? What emotions are happening in the photo? What season is it in the photo? What would the scent and sounds of this picture be? Narrative short stories are used to read to the students. (Amy Tan’s Fish Cheeks is a good example). We wrap up this OPEN phase with a Narrative Story Festival. Parents are invited and this is the first time the storyteller (our extended team member) is introduced. She is invited as a special guest and tells her own narrative story. She will return several times over the course of the unit to present workshops for students as they dig into their own cultural stories. Later this week, I will share the collaborative process and the other phases in the unit. Good evening, fellow GID lovers! I’m back again today to (finally) tell you more about the unit we are developing for Norman Public Schools 5th grade science curriculum. You’ve met our team, read about the importance of a collaborative culture, and heard my thoughts on GID at the district level. Today, I walk through the first four phases of our project so you can see exactly what we’ve planned. What did the events have in common? Can you think of ways that nature interacts that weren’t in the videos? Has nature ever made changes in your world? We hope that by showing students these dramatic interactions in videos, they will develop an interest in the topic and begin to form some questions about interactions between the spheres. 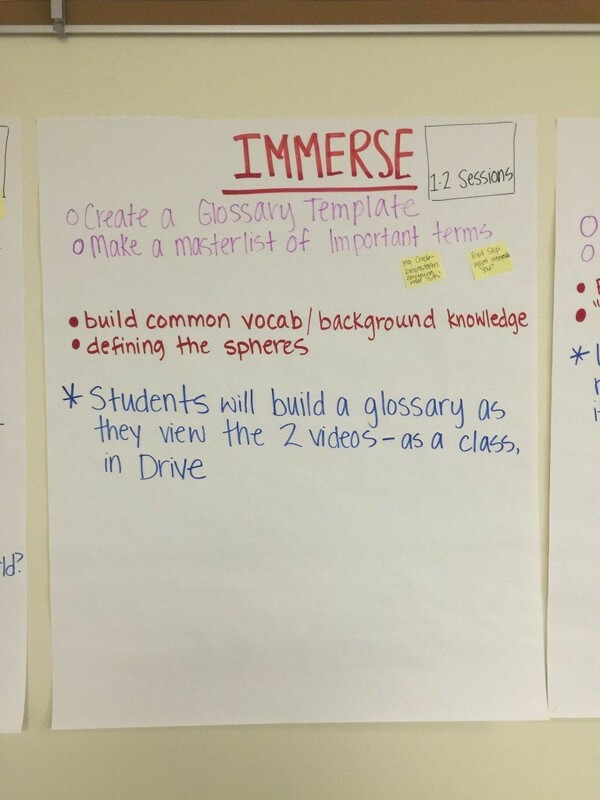 After viewing the videos, students will build a glossary of new terms they heard in the videos. This is an example the the flexibility I talked about yesterday. Depending on the students, teachers, and resources at the individual site, this step could look very different. Students could do this as a class, in small groups, with the teacher, or with both the teacher and librarian. I love that we are building in adaptability to customize the unit for every school. Where possible, we are encouraging teachers to build this glossary in Google Drive, but no matter how it is done, students will be able to access the glossary throughout the rest of the unit. 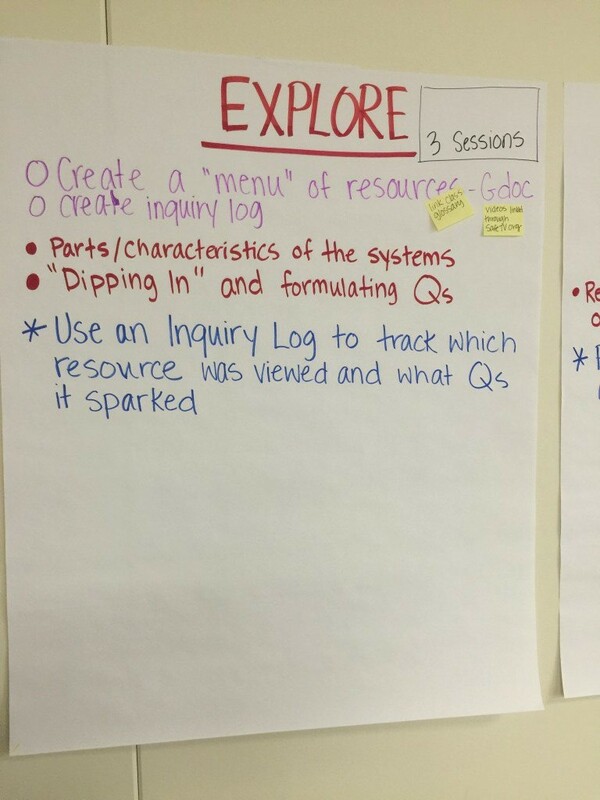 Using an inquiry log, students will explore through a carefully curated resource menu. They will track which resources they viewed and the corresponding questions that were sparked. In my personal experience with Guided Inquiry, I have learned that it is difficult for elementary students to foresee the scope of their research from the beginning phases. If we ask them to explore open-endedly, they can easily get off track, and they don’t understand the benefits of this phases as older students might. 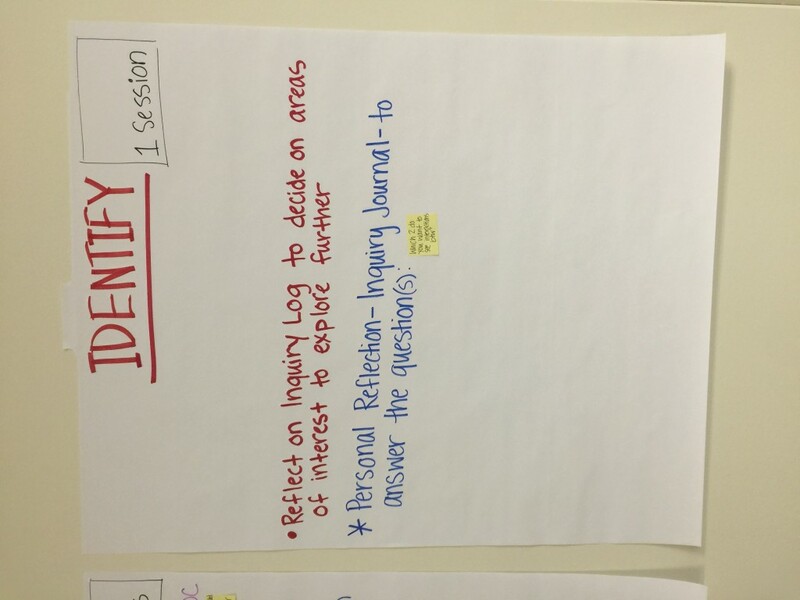 Assigning an inquiry log or journal in this phase is crucial to the success and engagement of younger students. As you can see from the picture of our notes, this phase isn’t quite as fleshed out as the rest yet. To identify which two spheres’ interactions are most interesting to them, the student will use an inquiry journal to elaborate on what they logged in EXPLORE. 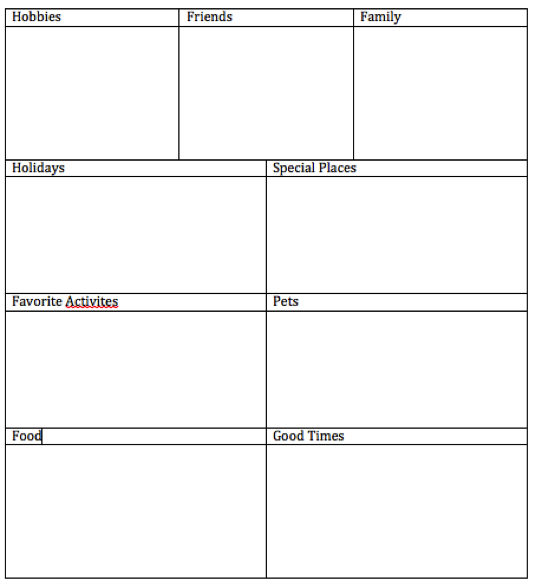 To facilitate this, our planning team will come up with specific questions for a journal prompt. After evaluating the journal responses, teachers will assign students to inquiry circles based on their area of interest. The inquiry circles will consist of students who are interested in the interactions between the same two spheres, so there will be six inquiry circles. We are allowing for flexibility here, but we discussed how fun it would be to have all 5th grade students in one school divided into these six inquiry circles. And there you have it: the first four phases of our plan. What do you think? What do you see that you like? What would you change?